﻿ About Ocean Queen｜Ocean Queen｜Offer High Quality Sea Urchin delivery since 1974 in Vernon, CA. 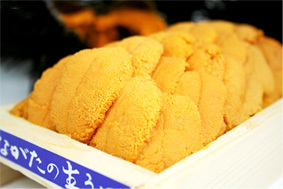 Since our family established Ocean Queen in 1974, we have continually provided the freshest, top quality sea urchin to restaurants and fish markets locally, domestically, and internationally with daily shipments to Japan's Tsukiji market. Our sea urchin is packed fresh daily on site and we offer free local delivery from our processing plant located in Vernon, CA. Ocean Queen has over 70 employees which include sea urchin processors and packers. We also currently have 16 reliable sea urchin boats with over 35 divers fishing in Santa Barbara, CA. We then have a 35-foot refrigerated semi-trailer truck transport the live sea urchin from the Santa Barbara harbor to our plant in Vernon, CA where we process and pack the sea urchin on site. Place an order of our renowned sea urchin today and see why purchasing from Ocean Queen is the best choice for fresh, top quality, flavorful sea urchin.